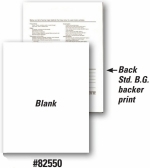 Blank front for custom printing. Back side has standard buyers guide backer print. Form size is 8 1/2in x 11in. Fade resistant. Gray back. Packaged 100 per pack. In stock for quick shipment.